Alexandre Masino’s paintings navigate between mimesis and invention; responding to observed reality, memory and imaginative perception. The transition between these realms creates a fertile territory for Masino to develop a rich vocabulary where representation and the physicality of the medium enhance each other, creating a minimal and contemplative imagery. Over the past twenty years, Alexandre Masino's works have been presented in more then fifty solo and group exhibitions in public and commercial galleries across Canada, the United States and Europe. Born in Montreal in 1972, he was awarded a B.F.A. with honours in Studio Art from Concordia University in 1996. 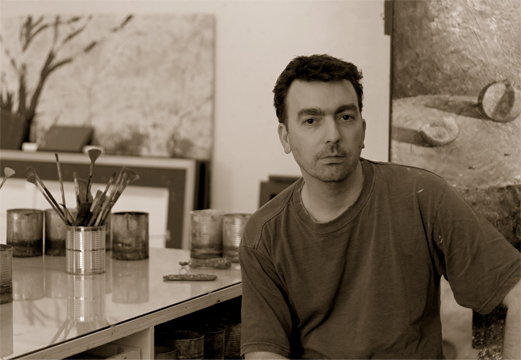 His tableaux and monotypes are recognized as references in the field of encaustic painting, having been included in curated shows and publications. Masino regularly teaches at the International Encaustic Conference in Massachusetts. He has also been invited to exhibit and teach a masterclass at R&F Handmade Paints in Kingston, New York.